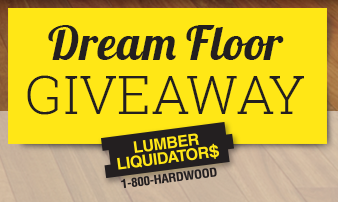 Lumber Liquidators Dream Flooring Giveaway Sweepstakes – Win $5,000 in flooring & more! Win $5,000 in flooring and $2,500! ENTER SWEEPSTAKES HERE – Lumber Liquidator Sweepstakes page. SWEEPSTAKES ENTRY PERIOD – Beginning at 9:00 a.m. Eastern Time (“ET”) on December 29, 2015 until 5:00 p.m. ET on February 18, 2016. PRIZES – The Grand Prize Winner shall win the following (the “Grand Prize”): (i) a gift certificate redeemable for $5,000 in flooring products from Lumber Liquidators, Inc.; and (ii) $2,500 cash (presented in the form of a check). Approximate retail value (“ARV”) of the Grand Prize: $7,500. 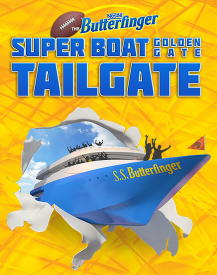 Butterfinger Super Boat Golden Gate Tailgate Sweepstakes – Win a trip to San Francisco & more! Win a trip to San Francisco (for winner and up to 9 friends), a $50,000 Stub Hub gift card & $30,000! ENTER SWEEPSTAKES HERE – Butterfinger Sweepstakes page. ENTRY LIMIT – Limit: During the Grand Prize Entry Period, each entrant may receive one (1) entry into the Grand Prize drawing by entering via Text Message or the Online Alternate Method of entry, and one (1) EXTRA entry into the Grand Prize drawing by entering through the Additional Website. ELIGIBILITY – Super Boat Golden Gate Tailgate is open only to legal residents of the fifty (50) United States and the District of Columbia who are at least eighteen (18) years old at the time of entry. SWEEPSTAKES ENTRY PERIOD – The Sweepstakes begins on December 20, 2015 at 12:00 a.m. Eastern Time (“ET”) and ends on February 7, 2016 at 11:59 p.m. ET. PRIZES – ONE (1) GRAND PRIZE: A trip for the winner and up to nine (9) friends to San Francisco, CA February 5-8, 2016. Trip package includes round-trip coach-class air transportation for ten (10) from an airport near winner’s home (determined by Sponsor in its sole discretion) to San Francisco, CA; three (3) nights’ standard hotel accommodations at a hotel determined by Sponsor in its sole discretion (five (5) rooms, double occupancy); four hour boat tour including food and beverages for 10 people (determined by sponsor), round-trip ground transportation to Pier 40 to board boat; a $50,000 Stub Hub gift card (terms and conditions apply); and $30,000. Winner and travel guest(s) must travel on February 5, 2016 and return on February 8, 2016 or prize will be forfeited in its entirety (or in the case of travel guests not being able to travel on those dates, they will not be eligible to be deemed a travel guest). Travel must be round trip. Approximate Retail Value (“ARV”) up to $128,500. TWO THOUSAND FIVE HUNDRED (2,500) FIRST PRIZES fifty (50) awarded per Daily Entry Period): A $50 Visa gift card. See gift card for restrictions. ARV: $50. HGTV 2016 Dream Home Sweepstakes – Win the 2016 HGTV Dream Home and much more! Win the 2016 HGTV Dream Home & more! You may also enter at DIY Network. ENTRY LIMIT – Limit 2 entries per person, per day (one per entry site each day). ELIGIBILITY – This Sweepstakes is open only to legal residents of the U.S. and its territories, possessions and commonwealths who are 21 years of age or older as of December 28, 2015. PRIZES – Grand Prize: One (1) Grand Prize Winner shall win the Grand Prize, which consists of: (i) the home located in Merritt Island, Florida (the “HGTV Dream Home 2016”) that is featured in the “HGTV Dream Home 2016” special (including home furnishings, fixtures, artwork, and merchandise) (approximate retail value (“ARV”): $1,389,201; (ii) Two Hundred and Fifty Thousand Dollars ($250,000) (awarded in the form of electronic funds transfer) courtesy of Quicken Loans (the “Cash Prize”); (iii) a 2016 GMC Acadia Denali automobile (MSRP: $53,805) (the “GMC Prize”); and (iv) a 2016 Bryant Sperenza model boat (MSRP: $57,750) (the “Boat”). Actual value of HGTV Dream Home 2016 depends on market fluctuations. All components (as applicable) of the HGTV Dream Home 2016 will be selected by Sponsor at its sole discretion. n lieu of taking title to the HGTV Dream Home 2016 (and the contents of the HGTV Dream Home 2016), the Grand Prize Winner will have the option of receiving $900,000 in cash in lieu of the HGTV Dream Home 2016 (the “Cash Option”). If Grand Prize Winner elects to take the Cash Option, the Grand Prize winner will still receive the Cash Prize, the GMC Prize, and the Boat. Total ARV of Grand Prize is $1,750,756 if Grand Prize Winner takes title to the HGTV Dream Home 2016 or $1,261,555 if Grand Prize Winner selects the Cash Option in lieu. 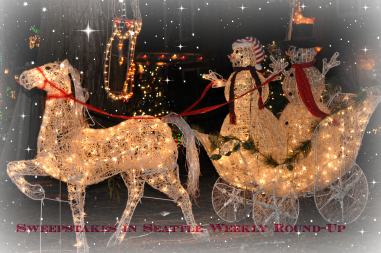 Sweepstakes in Seattle Weekly Round-Up 12/28 – Ending soon sweepstakes! Welcome to a slightly different weekly round-up! Since we are heading into the New Year and I have been taking some time to spend with my family, I thought I would do a round-up of the new sweeps I shared last week and all the sweepstakes that are ending before my next round-up. Winners will be shared on the next round-up (and we have had a nice amount of winners, so be sure to check out the winners list next week). The normal round-up should be back next weekend. 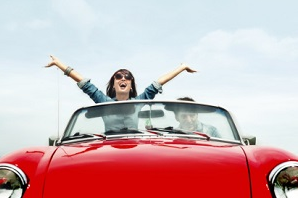 The State Farm® Never Say Never Sweepstakes – Win a trip for 2! Win a trip for 2 (2 winners)! 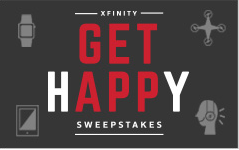 ENTER SWEEPSTAKES HERE – State Farm Sweepstakes page. ENTRY LIMIT – Limit one (1) entry per person and per email address per day during the Promotion Period, regardless of the method of entry. ELIGIBILITY – The State Farm Never Say Never Sweepstakes is open to legal residents of the fifty (50) U.S. and the District of Columbia who are eighteen (18) years of age or older as of date of entry. SWEEPSTAKES ENTRY PERIOD – The Sweepstakes begins at 11:00:00 AM Central Time (“CT”) on 11/11/15 and ends at 11:59:59 PM CT on 1/6/16. a) Family Fun in Florida Prize Pack: A trip for winner and one (1) guest to Orlando, FL. Trip includes round trip coach air transportation for two (2) from major U.S. gateway airport nearest winner’s primary residence in the U.S. to Florida; three (3) nights standard double occupancy hotel accommodations (one room); ground transfers to/from the airport/hotel in Florida, two (2) two-day passes to an amusement park at the Sponsor’s sole discretion, and a check in the amount of $500 which could be used towards food and other out of pocket expenses. Approximate Retail Value (“ARV”): $5,000. b) Weekend in the Big Apple Prize Pack: A trip for winner and one (1) guest to New York City, NY. Trip includes round trip coach air transportation for two (2) from major U.S. gateway airport nearest winner’s primary residence in the U.S. to New York; three (3) nights standard double occupancy hotel accommodations (one room); ground transfers to/from the airport/hotel in New York, one (1) Broadway.com gift card in the amount of $300 which can be used towards a Broadway show while in NYC, and a check in the amount of $500 which could be used towards food and other out of pocket expenses. ARV: $5,000. c) Soak up Napa Valley Prize Pack: A trip for winner and one (1) guest to Napa, CA. Trip includes round trip coach air transportation for two (2) from major U.S. gateway airport nearest winner’s primary residence in the U.S. to California; three (3) nights standard double occupancy hotel accommodations (one room); ground transfers to/from the airport/hotel in California, a private limo tour of Napa Valley (not to exceed 6 hours in duration), a 2-hour cooking class and a check in the amount of $500 to be used towards activities while in Napa, CA. ARV: $5,000. d) Southwest Spa Getaway Prize Pack: A trip for winner and one (1) guest to Sedona, AZ. Trip includes round trip coach air transportation for two (2) from major U.S. gateway airport nearest winner’s primary residence in the U.S to Arizona; three (3) nights standard double occupancy hotel accommodations (one room); ground transfers to/from the airport/hotel in Arizona, the choice of a golf or spa package valued up to $1,000 and a check in the amount of $500 which could be used towards food and other out of pocket expenses. ARV: $5,000. As Seen on Glad Sweepstakes – Win a $250 Visa gift card! Win a $250 Visa gift card (9 winners)! Watch the video to find where the cash is hidden (there are 5 stacks hidden in the video – you may have to re-watch the video to spot them or have the prompts show up). You will need to tweet for each stack you find (an entry for each tweet). You will need a Twitter account to enter. ENTRY LIMIT – You automatically will receive one (1) entry into the applicable Entry Period drawing for each qualified Tweet. Limit: You may receive up to five (5) entries in Entry Period 1 and up to four (4) entries in Entry Period 2. Each entry must include the hashtag provided by Sponsor. ELIGIBILITY – As Seen on Glad Sweepstakes is open only to legal residents of the fifty (50) United States and the District of Columbia who are at least eighteen (18) years old at the time of entry. SWEEPSTAKES ENTRY PERIOD – The Sweepstakes begins on December 17, 2015 at 12:00 p.m. Pacific Time (“PT”) and ends on February 29, 2016 at 11:59 a.m. PT. Entry Period 1 begins Dec. 17, 2015 and ends Jan. 25, 2016. Entry Period 2 begins Jan. 25, 2016 and ends Feb. 29, 2016. PRIZES – NINE (9) GRAND PRIZES (awarded five (5) for Entry Period 1 and four (4) for Entry Period 2): A $250 Visa gift card (terms and conditions of gift card apply). Approximate Retail Value: $250. 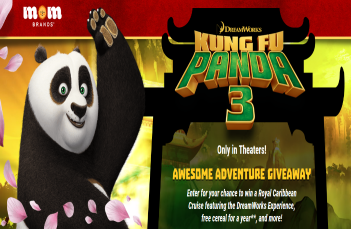 MOM Brands Kung Fu Panda Awesome Adventure Giveaway & IWG – Win a Caribbean cruise & more! Win a Caribbean cruise & more! ENTER SWEEPSTAKES HERE – MOM Brands Sweepstakes page. ENTRY LIMIT – Regardless of the method used to obtain a Code, there is a limit of one (1) Game Play per day, during the Promotion Period. ELIGIBILITY – This Promotion is offered only to legal residents of the fifty (50) United States and the District of Columbia who are at least thirteen (13) years old at the time of entry. Minors (under 18) must have written permission from their parent/legal guardian to participate. SWEEPSTAKES ENTRY PERIOD – The Promotion begins on December 14, 2015 at 12:00 PM (noon) Eastern Time (“ET”) and ends on May 31, 2016, at 11:59:59 PM ET. PRIZES – Grand Prize (1): The grand prize includes two (2) 7-night Royal Caribbean Cruise certificates and up to $4,000 awarded as a check made payable to the winner ($1,000 per traveling guest) (“Grand Prize”). Each Grand Prize 7-night Caribbean Cruise certificate is redeemable for one (1) double-occupancy state room for up to two (2) people. If winner travels with less than three (3) guests, winner will not receive any additional compensation. The ARV of the Grand Prize is up to $10,800. The actual value of the Grand Prize may vary based on factors including but not limited to, if guest(s), and the number of guests that accompany the winner. Any difference between the stated ARV and actual value of the Grand Prize will not be awarded. Sweepstakes Bonus Prizes (4): The bonus prize is a year supply of MOM Brands cereal awarded in free product coupons with a value up to $338 (“Bonus Prize”). There will be four (4) Bonus Prizes available. The ARV of each Bonus Prize is $338. i. Kung Fu Panda Swag Bag Prizes (100): The Instant Win Game Swag Bag prize is an official Kung Fu Panda Swag Bag (“Swag Bag Prize”). Each Swag Bag Prize includes Kung Fu Panda DVD/Blu-Ray combo pack, Kung Fu Panda 2 DVD/Blu-Ray combo pack and Kung Fu Panda 3 branded merchandise: drawstring bag, t-shirt, cap, and Po chopsticks. There will be no more than one hundred (100) Swag Bag Prizes available. Size of t-shirt will be selected by Sponsor in its sole discretion. The ARV of each Swag Bag Prize is $115. ii. Movie Ticket Prizes (300): The Instant Win Game Movie Ticket prize is a four (4) pack of movie tickets awarded as a Fandango Promotional Code valid towards 4 movie tickets ($11 per ticket, up to $44 total ticket and convenience fee value) to see any movie (“Movie Ticket Prize”). Fandango Promotional Code must be redeemed by 12/31/16 and is void if not redeemed by the expiration date. 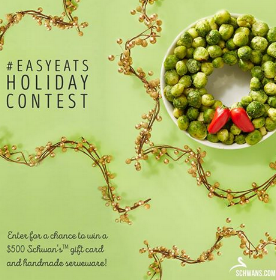 Schwan’s™ Easy Eats Holiday Sweepstakes – Win a $500 Schwan’s gift card & more! Win a $500 Schwan’s gift card & an Epicurean serve ware set! ELIGIBILITY – The Schwan’s™ Easy Eats Holiday Promotion (the “Promotion”) begins at 10:00 a.m. Central Time (“CT”) on December 1, 2015 and ends at 11:59 p.m. CT on December 31, 2015. 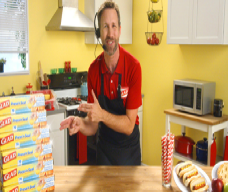 SWEEPSTAKES ENTRY PERIOD – The Schwan’s™ Easy Eats Holiday Promotion begins at 10:00 a.m. Central Time (“CT”) on December 1, 2015 and ends at 11:59 p.m. CT on December 31, 2015. PRIZES – One (1) Grand Prize: $500 Schwan’s™ Gift Cards and an Epicurean serve ware set. ARV: $550. Gift card is subject to issuer’s terms and conditions.